How does Google decide which webpage to show for every search query? And how does it decide the ranking of every result? The answer is algorithms. Google uses a complicated set of algorithms to determine which webpage is the best fit for every search query. And in these algorithms, many factors are taken into account. These factors are known as Google Ranking Factors. 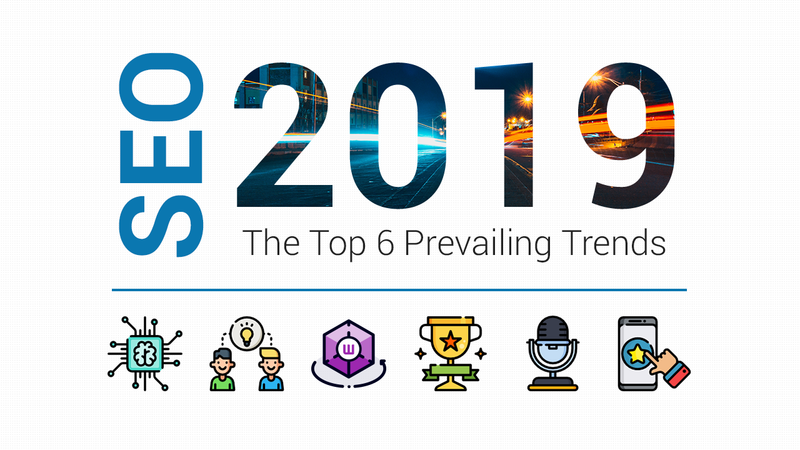 Although Google has never explicitly revealed what these factors are, there are over 200 ranking factors that have been identified and agreed upon by the consensus of SEO experts. Example of some of these Google ranking factors are page load time, quality of backlinks, length of content, keywords, keyword density, LSI keywords, URL, time on page etc. All these Google ranking factors are crucial for SEO and everyone knows that. But in this article, we’re NOT going to talk about Google Ranking Factors. Instead, we’re going to talk about Indirect Google Ranking Factors. 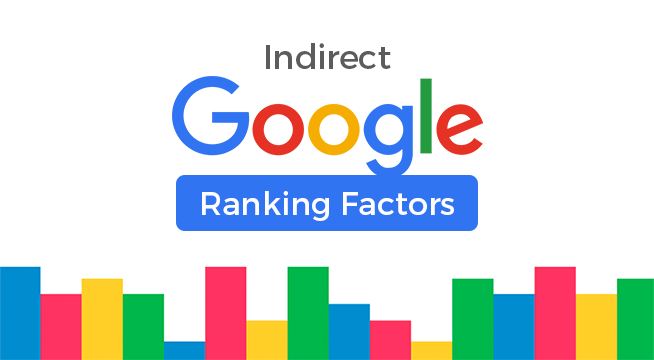 What The Heck Are Indirect Google Ranking Factors? In case you’re wondering what the heck are indirect Google ranking factors, they are factors that are not taken into account in Google’s algorithm. Wait, if they’re not taken into account, why should we spend our time to know them? Because even though they’re not taken into account, they are highly correlated to Google search rankings. These correlations exist for various reasons so you definitely do not want to overlook or ignore them. *Disclaimer: Since Google is extremely secretive about their algorithms and rarely reveal which factors are taken into account, most of these Google ranking factors and Indirect Google ranking factors are decided through general consensus and may not be 100% accurate. Readability of one’s content sounds like a far fetch from being influential to a website’s ranking, but really, it’s not at all. First of all, let’s answer the question to “how to measure readability?” It’s actually quite easy. There are several methods to measure a content’s readability, one of the most popular methods would be using the Flesch-Kincaid readability algorithm. The concept of the algorithm is simple, fewer syllables word and shorter sentences gets a higher Flesch-Kincaid readability score. To easily calculate your Flesch-Kincaid readability score, you can go to this website and paste your content in the text box, then it will automatically calculate your readability score. This website also calculate other forms of readability score, such as Gunning-Fog Score, Coleman-Liau index, SMOG index, and Automated Readability index. 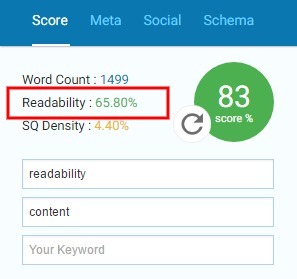 If you have SEOPressor Connect installed on your website, you’ll be able to get your readability score as soon as you’ve created your content, and click the “Analyze” button on SEOPressor Connect. One research has found that results on the first page of SERPs have an average Flesch-Kincaid readability score of 55, while the results on second page has an average score of 40. Why is there a correlation here? The simple reason for this is, people prefer reading easy to read articles. By making your content easier to read, you are actually increasing the chances of your readers reading your entire content. And hence, increase the readers time staying on your page. If an article is difficult to read, people will just leave because reading a complicated article is just too tiresome. Break up long and complicated sentences into several short and concise sentences. Avoid using difficult or complicated words, use easy and simple words instead. For example: “use” instead of “utilize”, “then” instead of “subsequently”. Break long paragraphs into several shorter paragraphs. This will not increase the readability score but it will make your article easier to read. Make use of text decoration tags such as h1, h2, h3, bold, underline, italic, ul and li. There are many types of meta tags that search engines read and understand. 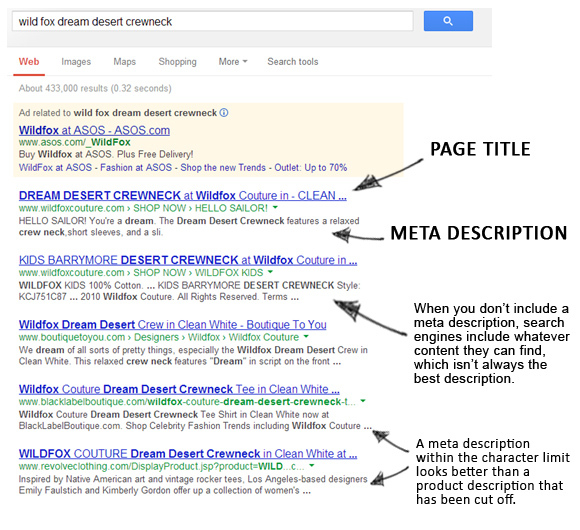 Two of the most important meta tags are the meta title tag and meta description tag. These meta tags are snippets of text that describe your content to search engines. Meta tags are not displayed on the page and is only within the codes of the page. It is pretty much confirmed that Google doesn’t take meta tags as their ranking factors. In fact, Matt Cutts (ex-Google’s spoke person) have came out and explicitly reveal this. Meta tags are still important as your readers might still read it on the Google search results and affect the click through rate. By default, Google should display the meta description that you have provided. However, Google has been more liberal with this and have been taking things into their own hand by changing your description to snippets extracted from your content. Google does this when they think that the meta description you have provided is not relevant to the search query, or if they think that they could provide a better description than you do. So, it is important for you to provide a meta description that explain the content of your article accurately to let searchers know what your article is about. The meta tags make a huge difference in click-through rates and having a good click-through rate will be beneficial for your SEO. Meta title should be around 55-60 characters. Longer titles would be truncated. Meta title should be similar to your blog title. Meta title should include keywords that you are targeting. Meta description should be around 150-160 characters. Longer descriptions would be replaced or truncated. Meta description should accurately describe your content. Meta description should include keywords that you are targeting. 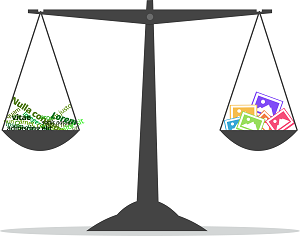 You might be surprised with this one, but there is substantial evidence that the amount of media in a post correlates greatly with traffic. 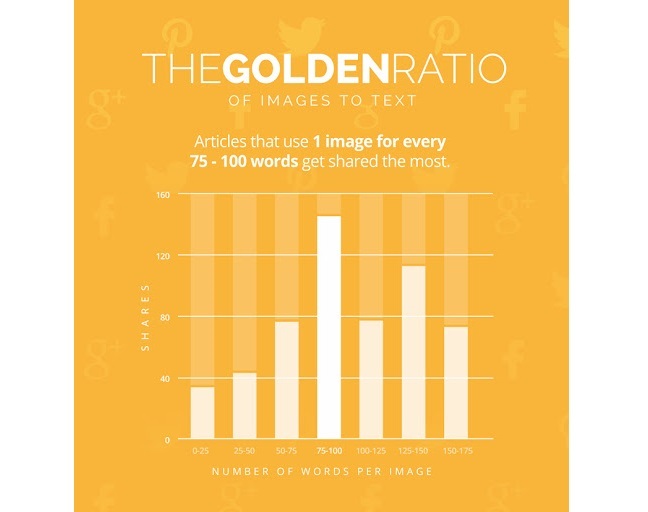 Studies have shown that content with an image to text ratio of 1 image to 100 words get shared the most while content with less or more images gets shared less. You don’t want to bombard your readers with a wall of text without any image, and you don’t want to just put too much image and have no context. It’s not hard to see why content with an ideal amount of images has such a high correlation with shares and traffic. Humans are visually inclined, by adding images into your content, you make your content much more interesting and pulls the readers attention. Besides, images can also break up the monotony of text, segment your content into different sections, and make it less intimidating to read. Make sure your image to text ratio is around 1:100. Use images to break huge wall of text into smaller chunks. Consider using different formats of visual content, such as video or gif. Consider repurposing your content into infographic or video. Make sure images included are relevant/provide value to content. Consider designing your own graphics. This will make it unique and also present your own style. Use graphs or tables to present sets of data. Google have once said that social signals are not a ranking factor and since then many people have stick to it. However, this announcement was made years ago, prior to many algorithm updates. And since Google doesn’t make announcements often and even if they do they rarely reveals everything. Maybe in one of the many updates, Google have added social signals as a ranking factor, who knows? Either way, we can agree that social signals will impact search engine rankings. There are plenty of case studies to prove this point, and lucky for us, Quicksprout has taken some of these case studies and convert them into a simple and easy to understand infographic. Even if social signals are not a direct ranking factor, there are plenty of reason why it correlates so well with search engine rankings. Having social signal means that your content is being shared around, which means that there are traffic coming to your page from different sources. This is an indication to Google that your content is well received. Another reason why social signal correlates with search ranking is the freshness factor. When someone comes to your page and comment on it, Google will see it as fresh and new content, which will improve your ranking score. Promote your content on social media at the right times. Reply to all the comments sincerely and immediately. Write your content in a conversational tone. Make use of #hashtags in social networks. This one is slightly more technical and you may want to talk with the webmaster of your page on this. Whether you are having a dedicated IP address or a shared one isn’t a ranking factor, but having a dedicated IP address has so many benefits that you should really consider getting it. 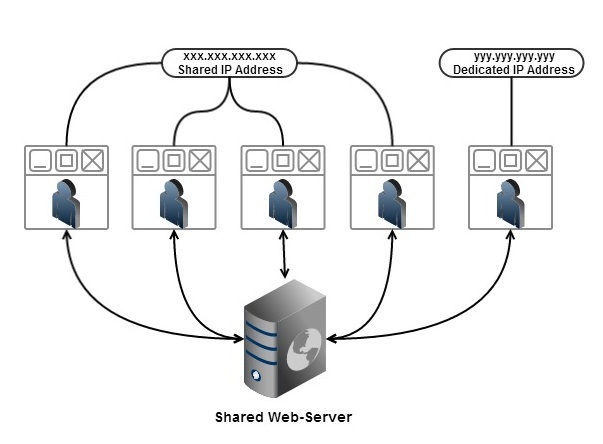 One of the main benefits of having a dedicated IP address is that you do not need to worry about your IP address reputation. Since you are not sharing your IP address with anyone else, you can control and monitor the reputation of it directly. Gives you a higher stability. Grants access to your website anytime you need. Good for your business identity. 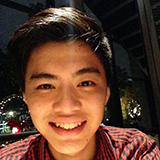 They are required for certain third-party applications/scripts. SNI technology and incompatibility with some old browsers. Besides the big list of Google ranking factors, there are also indirect Google ranking factors, which can also affect your search engine rankings. And since these indirect factor have such a high correlation with your search engine rankings, you want to make sure that you do not ignore or overlook these factors.